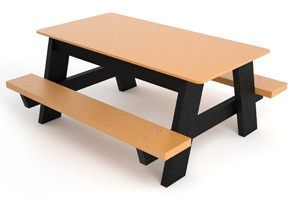 Kids will enjoy endless hours of summer playtime with this high-quality commercial grade picnic table. Made with a solid sheet recycled plastic table top designed specifically to provide a smooth surface for children to write or draw at the table. The seats are made with 2" x 4" recycled plastic Resinwood slats, and the black support structure is made from a combination of 2" x 6" and 2" x 4" slats. Although this table is sturdy enough to stand on its own it is designed with easy mounting in mind. There are in-ground or surface mounting kits available in the accessories section to provide a more permanent installation option. Your choice of table top and seat color shown below.